- where you can see what other quilting bloggers are up to. First up, what's been happening in my sewing room. I must admit, I did struggle a little with my 'flying geese overload' quilt top. It's an eclectic mix of busy pattern & bold colour, and I spent quite a bit of time wondering just how to get this to work. I initially pulled out the blocks that had grey fabrics in them . . . and then I decided to put them all back in again. I then put all the 6 1/2" x 12 1/2" blocks up on the design wall, alternating the warm and cool rows, with a few mixed up or blurred areas just so it wasn't too predictable. I also made a few blocks that were monochromatic. And I grouped a few geese together, ones that had the same fabric running through them for some semblance of continuity. Here's where I ended up . . . It's not my most favourite (almost) finish, but I'm certainly much happier with it now. 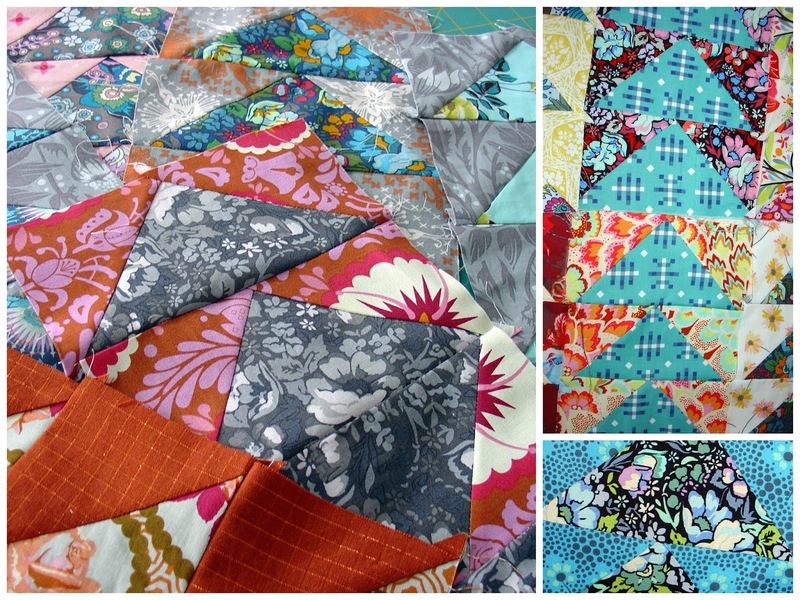 I just loved piecing these using the nowasteflyinggeese method! How do you carry on when something you are working on doesn't seem to come together as you had hoped? Do you try to find a way to make a 'flat' WiP better? Or do you move onto something more enjoyable? I'd love to hear you thoughts on this. That's it from me this week, do you have a project to share this week too? Link up any post from the past week that features a sewing or stitching project you have been working on, whether they are WiPs, starts or finishes. You can write as much or as little about your project as you like, and snap off a pic or three, and share here. Somewhere in your post, please link back to this one. Loving all the colours and fabrics in this Linda. I would never have the patience to do all those HST. I like the busy look. So many gorgeous fabrics. I have a soft spot for flying geese quilts and surely the ones made with AMH fabrics! super cute........a low volume one would look great! Like your arrangement of blocks,Linda. Gorgeous, I love flying geese. I've been known to start all over if something isnt coming together as planned. Now, I start with the area or block that I suspect will be cantankerous to limit my work or waste. I like your arrangement, keeps the eye moving and there's good contrast. get inspired. That seems to help me. Stress and forcing the issue always ruin my creativity. It is just perfect!! The link to the geese tute did not work for me. I think the Flying Geese quilt is fantastic! Lots of colour and movement Linda. I usually leave a project I'm not happy with on one side for a while and then come back to it when inspiration strikes. If inspiration doesn't strike then the piece/pieces are put away in my parts box! I quite like it. Have you thought about having every second row of geese flying upside down (and did you know the second block in from the top has two upside down?)? It might just change the movement. Try a border on it too to see if that lifts it for you. Otherwise put it away for a couple of weeks and then look at it with fresh eyes. Your groupings worked out beautifully! Lots of gorgeous colors and textures in that project. Lots to look at. I adore flying geese quilts and this one is no exception. Great job mixing and blending these fabrics! Those fabrics are so vibrant and your geese are perfect. I should try a project like this just to practise precision which I badly need.